Concussions are a major health concern as they cause significant acute symptoms and in some athletes, long-term neurologic dysfunction. Diagnosis of concussion can be difficult, as are the decisions to stop play. To determine if concussions in adolescent male hockey players could be diagnosed using plasma metabolomics profiling. Plasma was obtained from 12 concussed and 17 non-concussed athletes, and assayed for 174 metabolites with proton nuclear magnetic resonance and direct injection liquid chromatography tandem mass spectrometry. Data were analysed with multivariate statistical analysis and machine learning. The estimated time from concussion occurrence to blood draw at the first clinic visit was 2.3 ± 0.7 days. Using principal component analysis, the leading 10 components, each containing 9 metabolites, were shown to account for 82 % of the variance between cohorts, and relied heavily on changes in glycerophospholipids. Cross-validation of the classifier using a leave-one out approach demonstrated a 92 % accuracy rate in diagnosing a concussion (P < 0.0001). 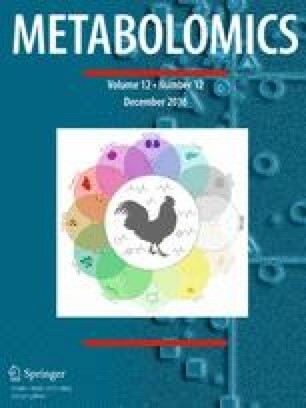 The number of metabolites required to achieve the 92 % diagnostic accuracy was minimized from 174 to as few as 17 metabolites. Receiver operating characteristic analyses generated an area under the curve of 0.91, indicating excellent concussion diagnostic potential. Metabolomics profiling, together with multivariate statistical analysis and machine learning, identified concussed athletes with >90 % certainty. Metabolomics profiling represents a novel diagnostic method for concussion, and may be amenable to point-of-care testing. The online version of this article (doi: 10.1007/s11306-016-1131-5) contains supplementary material, which is available to authorized users. We thank Ms. Christy Barreira and Ms. Sandra Shaw for excellent technical support, and Ms. Kathryn Manning and Mr. Kevin Blackney for assistance with data. We graciously acknowledge analytic support from The Metabolomics Innovation Centre at the University of Alberta, Edmonton, AB (Ms. Rupasri Mandal, Ms. Jennifer D. Reid and Dr. David Wishart). This study was supported by the Children’s Health Foundation (http://childhealth.ca/) grant to DDF. The authors have filed a patent application for metabolomics profiling of central nervous system injury (US Trade and Patent Office No. 62/135886). This study was approved by the Human Research Ethics Board at Western University (#103365). Written informed consent was obtained from the legal guardians and assent was obtained from adolescent subjects.